Synthesis of the ASTI–Award Benchmarking Survey on Gender-Disaggregated Capacity Indicators. IFPRI Discussion Paper 00957. Female farmers play a vital role in African agriculture, accounting for the majority of the agricultural workforce. However, agricultural research and higher education are disproportionately led by men. There is an urgent need for greater representation of women in the field of agricultural science and technology (S&T) in Sub-Saharan Africa. Female scientists, professors, and senior managers offer different insights and perspectives to help research institutes to more fully address the unique and pressing challenges of both female and male farmers in the region. Total capacity in terms of the professional staff employed at the agricultural research and higher education agencies included in this study increased by 20 percent between 2000/01 and 2007/08, and women constituted almost half of this capacity increase. The female population of professional staff grew by eight percent per year on average, which is four times higher than the comparable rate of increase for the male population, indicating that the gender gap in African agricultural sciences is closing. The proportion of female professional staff employed at the sample agricultural research and higher education agencies increased from 18 percent in 2000/01 to 24 percent in 2007/08, but fewer women have advanced degrees compared to their male colleagues. In 2007/08, for example, 27 percent of the sample’s professional women held PhD degrees compared with 37 percent of the sample’s professional men. Of concern, about two-thirds of the overall (female and male) capacity increase comprised staff holding only BSc degrees, indicating that the overall quality of capacity in agricultural research and higher education is declining in some Sub-Saharan African countries. Notably, the total number of male professional staff trained to the MSc level declined between 2000/01 and 2007/08; however, more in-depth analysis is needed to explain the underlying causes of these shifts and to what degree they represent structural changes. 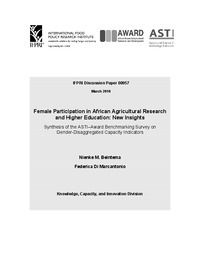 Levels of female participation in agricultural research and higher education among the sample agencies were particularly low in Ethiopia (6 percent), Togo (9 percent), Niger (10 percent), and Burkina Faso (12 percent). Shares of female professional staff were much higher in South Africa, Mozambique, and Botswana (32, 35, and 41 percent, respectively). The female share of students enrolled in higher agricultural education was higher than the female shares of professional staff employed at the agricultural research and higher education agencies in most cases, but a significant proportion of the female students concerned were undertaking only BSc-level studies (83 percent). Only 14 percent of the management positions were held by women, which is considerably lower than the share of female professional staff employed at the sample’s agricultural research and higher education agencies (24 percent). The pool of female staff is much younger on average than the pool of male staff. The prevalence of female professional staff is comparatively higher in fields related to life and social sciences, and comparatively lower in fields involving areas traditionally thought of as “hard science”, such as engineering.